Last week, I hinted a bit about making Christmas gifts. Here's the first I'll share with you. 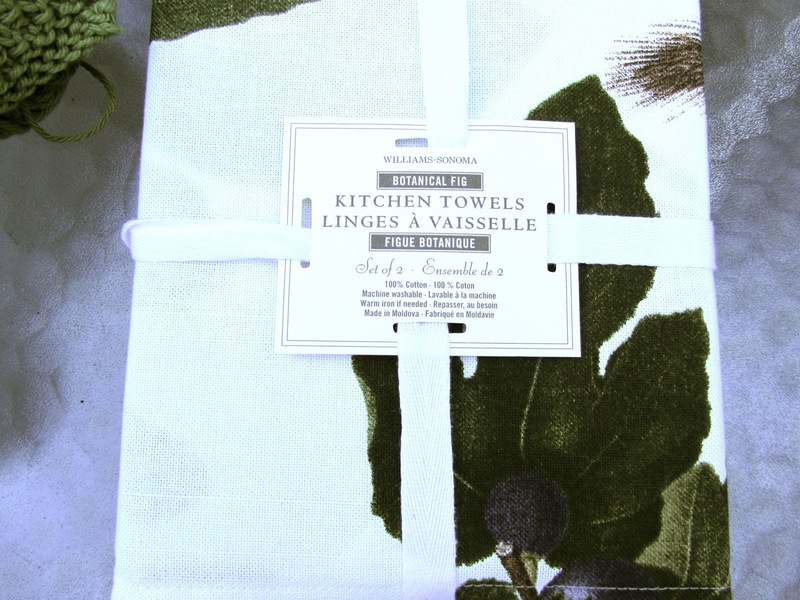 Last year, just after Christmas, I bought this set of 2 tea towels on clearance from Williams-Sonoma (half-price, I believe). This pattern suits someone on my gift list, my step-mom (she doesn't read my blog, so no worries that I've spilled the beans). 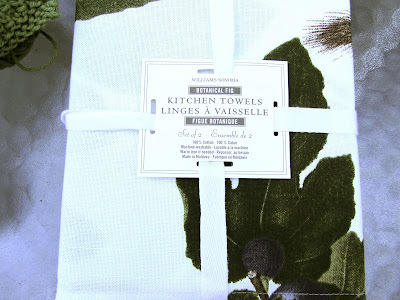 To add to these tea towels, I'm knitting dish cloths in this sage green, all cotton yarn. 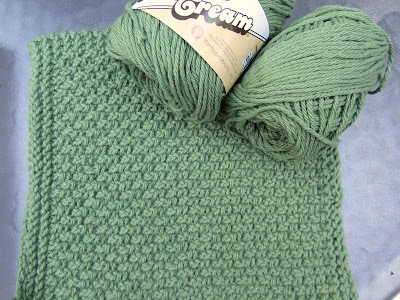 I bought this yarn in 2.5 oz balls from Michael's this past week, at $1 per ball (on sale, regularly $1.99/ball). I bought 2 balls, and used about 2/3 of a ball to knit one dish cloth, following, a pattern from this blog, Creating Laura. The finished size is about 8.25 inches, square, on size 7 needles, with worsted-weight cotton yarn (Sugar 'n Cream, by Lily). I'm a beginner knitter (still after all of these years, I've not made much progress LOL), but I was able to knit one cloth in about 6 hours. My plan is to make 3 dish cloths, with these 2 balls of yarn. If I can make 3 cloths, with 2 balls, at $1 per ball, my cost per cloth is 67 cents. To this gift, I'll add a vegetable brush (from Dollar Tree), and several homemade, gourmet soup mixes. My step-mom lives alone, and I think some easy-to-make soup will be a perfect gift for her in winter. As I find soup mix recipes that I try and like, I'll share them with you. A handmade gift is a gift of time, love and thought. At least that's how I feel about it. What a really nice idea. My secret is that I knit also and I also never got beyond basic knitting either! I want to try this dishcloth pattern and I'm already confused. When they say row one, does that mean just the one needle full of stitches? Is row two as you turn the needle to go back? Not sure if that makes sense. I think I forgot how to purl also. Guess I'll have to ask my mom or watch a tutorial! We haven't given gifts to anyone for several years already including not giving anything to our kids. We pay for so much of their education right now that there isn't much leftover and they all understand that and value that. But someday when that part of life is done, we may have son or daughter in laws with family's and then this will be handy. Think of row zero as the casting on. And of row one as the first row of knitting (coming back towards the yarn tail). Then row 2 is when you knit away from yarn tail. So, the rows 1-4 are all knit stitch. I went online to check on knit and purl stitches, and did a practice piece to get the hang of it (cast on about 15 stitches, and followed the instructions for knit 1 purl 1, knit 1 purl 1, for about 8 rows). Then I unraveled it and started out my dish cloth. As just a beginner knitter, this did really boost my confidence. I had a couple of glitches, but my daughters showed me how to fix them. I think having someone you can ask for help, from time to time, is invaluable. And for me, since I'm on the slow side, with knitting, starting early will be my key to getting everything done in time. Thanks for the pattern! 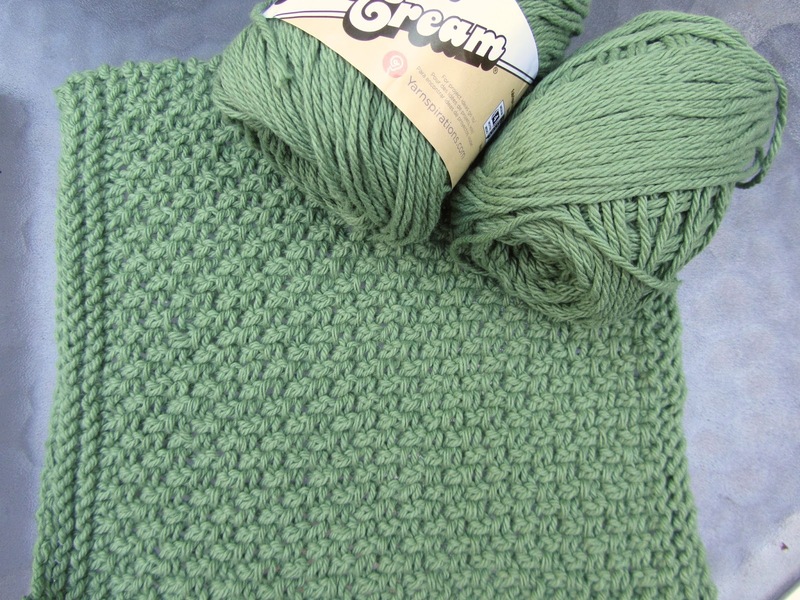 I'm using the same brand of cotton yarn which I bought for a good price at thrift stores. I love knitting dishcloths, because it is a great way to learn a new stitch or technique. And these make great gifts too, a touch of handmade goes a long way. 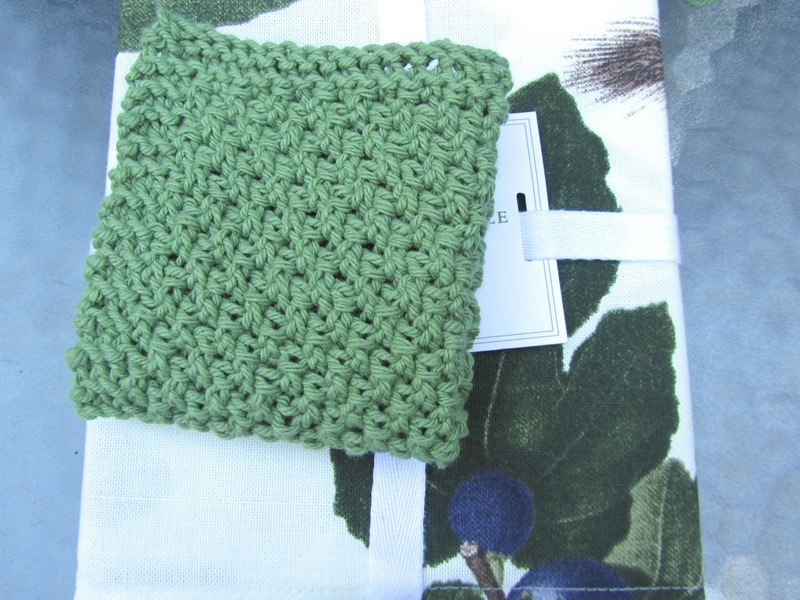 You had mentioned, last week, that you were knitting some dish cloths, and thought about using them as gifts. I think a couple of handmade dish cloths would be well-received. You're right about using something small like a cloth, to practice a new stitch. I think I would have been overwhelmed to try a new stitch on a sweater, or something else, that's large. Have a wonderful day, yourself, YHF! I lost my reply on my kindle fire (my error, hitting the back button by accident), so came to my laptop to try again. Have you ever tried knitting with tshirt yarn? I am looking forward to trying this, as tshirt yarn has not worked well with crochet (too stiff and lacy), or other methods like locker hooking or toothbrush braiding (uneven tension that resulted in some bad skewing). I have a stack of old tshirts that I was thinking of cutting into strips, but didn't want the same results. So I'm hoping knitting would be the answer since I can monitor tension on the needles. No, I've never tried this, YHF. I would imagine that you could make great bathroom rugs, using t-shirts. They would be so soft underfoot. When my rag collection from t-shirts becomes excessive, I'll try something like that with some of them. Let me know if you try it. How interesting ... several months ago, I made the decision to knit dish cloths for Christmas gifts. I still have a couple to do but almost finished. Isn't that funny! You made a much earlier start than I did, though! Good for you! I like the look of this pattern, when finished, for a dish cloth. It has a very vintage, kitchen-y look. And for a knit, it's not too stretchy. You caught my attention with a knitting post. I'm sure that doesn't surprise you. This is a pretty pattern and I appreciate that you put the dimensions of the finished dishcloth down--this sounds like a good size--so often, hand-knit dishcloths are small, and I like a larger one. The online tutorials are invaluable when you are learning or need to re-learn a stitch or technique. I have also found a chunky knit cowl and hat pattern for free on Ravelry that I have had consistently good luck with knitting and have made them as gifts (I even had a request for knitting them from my fashion-forward friend last winter!). I have discovered that I like quick and easy projects so those fit the bill. I made an afghan last winter on super huge needles that my dad had made for my mom years ago (I'm guessing they are about a size 50 needle)--that's probably the only way I'll ever make anything that large! I think I'm rambling. :) You are so on the ball with your gifts, Lili! Wow! You're right about the size on hand-knit dish and wash cloths. This is a bit smaller than woven dish cloths (the ones I have are about 10-inches square). But I think at 8.25 inches, they should be good. Oh, yes, love all of the online info on stitches and such. On another pattern I was trying out, I had to look something up, as I had no idea and I found very helpful instructions. I looked up size 50 needles -- wow, that afghan must have gone fast! That is so nice to have something that your father made. Those are a real family heirloom. How very sweet of him. Beautiful! And handmade gifts are so thoughtful and appreciated. When I was pregnant with my daughter, a group of friends held a baby shower for me. One of the gifts was a handmade baby blanket that she had entered into the county fair. She added the ribbon she won to the gift. It was just lovely. Oh, wow, Belinda! That's a treasure! And I'm certain that you were really touched by her meaningful gift. What a wonderful story. I have not progressed very far with my knitting either. My excuse is that I knit left-handed and there are very few instructions out there for left-handers. I taught myself when I was a kid and ended up left handed. Probably, because I am left handed. Anyway, while I have the basics down, I find it too hard to reverse the directions on more complicated things to follow them. A couple of years ago, I made a lot of knit and then felted purses. They were a lot of fun, but I saturated the people I give gifts to with them. (And I sold them at craft fairs. )Same goes for scarves and hats. However, everyone can always use another dish cloth. I'll have to watch for sales on cotton yarn and start knitting again. Thanks for the inspiration. Your felted purses sound lovely. I'm sure they were very well-received. Hmm, knitting for lefties -- there's a book in there someplace! have a good evening, live and learn! Lili how beautiful and green is my favorite color ! Your step mom will love this gift I am sure who would not . I can feel the love you put in this gift . Thank you Dee! I sure hope so.